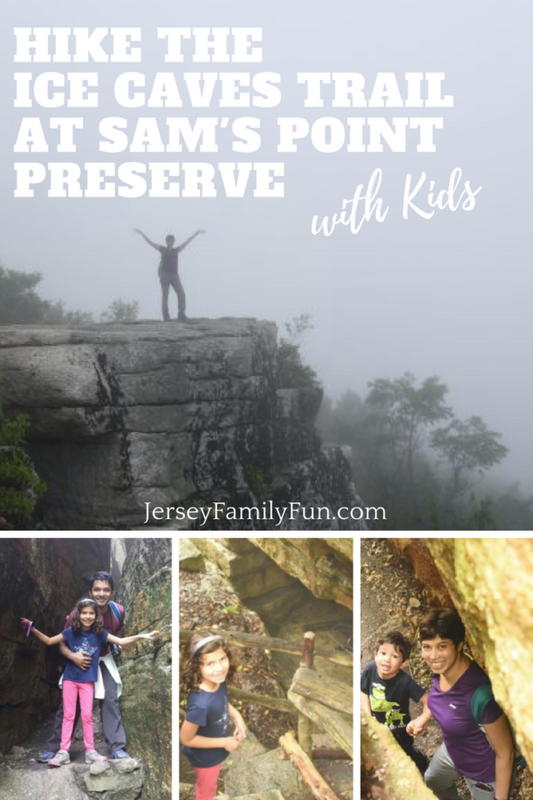 While sitting on the commuter train one Monday morning in June absentmindedly researching family friendly hikes in the area, I came across Sam’s Point Preserve. I was immediately intrigued and a further Google search confirmed that this was a hike I had to do – now. It sounded perfect – kid friendly, great views, and ice caves. Later that evening, I announced to my family that we would drive the 1.5 hours to this park on Saturday, regardless of weather. Maybe I jinxed myself, but we woke up bright and early on Saturday to a very gray and wet day. “No matter” I told myself feeling confident that it would clear (it didn’t). Sam’s Point Preserve is located in the southern section of Minnewaska State Park Preserve, and is part of the Shawangunk Mountains in New York. The Sam’s Point Road Loop is a 3 mile hike that takes you past Sam’s Point (scenic views) at about 0.6 miles from the parking lot, and then to a junction 0.5 miles past Sam’s Point. At the junction, follow the sign to the ice caves for another 0.3 miles to reach the Ice Caves Loop Trail. The Ice Caves trail is a 0.6 mile loop through the ice caves which descends rather steeply on a winding path that will take you past cliffs, through rock crevices, and under rock ledges. Snow can be found in the caves through early summer due to the cold air in the caves. Once you finish the Ice Caves trail, you can retrace your steps to the loop trail and either return the way you came, or continue the loop trail past Lake Maratanza and old berry picker shacks. From the Ice Caves trail, there also is an option to continue on the Verkeerderkill Falls Trail, but given the length of that hike (about 8 miles), we opted not go to the falls. The Sam’s Point Visitor Center opens at 9:00 a.m. Since I was concerned that the parking lot would fill up early, we made plans to leave at 7:30 a.m. to ensure we get there before 9:30 to secure a spot. The rain and fog outside should have warned me that the parking lot would be quite empty. After a quick stop at Dunkin Donuts, we arrived before 9:30 am to an absolutely empty parking lot. Well, at least we had our choice of spots! We paid the $10 parking fee, secured a map of the area, used the bathrooms, and began our trek. The rain had cleared, but the fog was so thick that we could barely see a few feet in front of us. It was both a bit unsettling and peaceful. I had read about the spectacular views from Sam’s Point and was eager to enjoy them, but all I could do was trust the internet as we arrived to a sea of clouds and fog. The kids enjoyed the foggy view, so we took a quick break for snacks before continuing on to the Ice Caves trail. It took a bit more hiking until we reached the Ice Caves trail at Sam’s Point, but the kids were immediately excited once we descended into the caves. The temperature drops quite substantially inside the caves, which is actually refreshing on a warm, albeit wet, day. The ice caves were absolutely amazing and we even got to see snow in June! We all enjoyed climbing up the wooden ladders, squeezing through the crevices, and exploring the dark passageways. Once we completed the loop and walked back to the intersection of the Sam’s Point Road Loop and Ice Cave Trail, we debated retracing our steps back down the loop trail, but ended up completing the loop for completeness and research purposes. 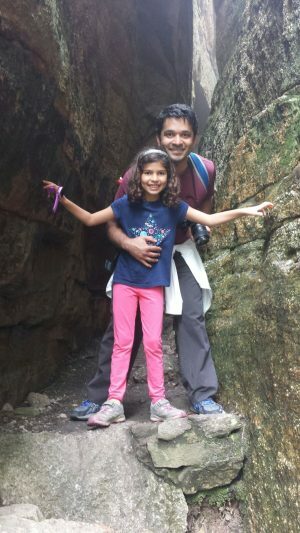 My 4 year old son and 7 year old daughter have grown up hiking, but if your kids are not used to hiking (yet! ), I would recommend returning back down on the loop trail. This is a slightly shorter walk, but affords you another chance to see the views at Sam’s Point. As we reached the far end of Lake Maratanza (also as far from the car as possible on this trail), it started to rain. Fortunately, it stopped quickly—lucky for us as we had no umbrellas. Lake Maratanza is the highest lake in New York’s Shawangunk Ridge, and provides a nice place to practice skipping rocks. We then continued past the dilapidated shacks which were built to house the “berry pickers” who lived there seasonally while harvesting the blueberries that are found in abundance in this area. My son is obsessed with abandoned houses, so he was fascinated to see the shacks (from a distance). As we arrived back at the car, the FitBit confirmed that we had walked over 4 miles at Sam’s Point. The fog and rain did not dampen the day, but rather added mystery and intrigue. We all agreed that this is one of our favorite hikes and one that we definitely want to return to again. 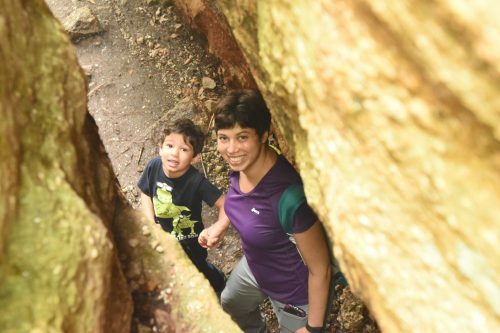 The Loop and Ice Caves trails at Sam’s Point Preserve are quite family friendly hikes, although you do have to exercise caution (especially with young kids) near the cliffs of the overlooks and in the ice caves. Late spring or early summer is the best time to visit the ice caves as they may not be passable at other times. Call the visitors center to confirm they are open before you head to Sam’s Point Preserve. Make sure to arrive early to secure a parking spot as parking is rather limited and weekends can be crowded. As always when hiking, wear comfortable shoes, carry water and snacks, and bring a jacket for the caves. Enjoy the fresh air, scenic views, and chilly ice caves! 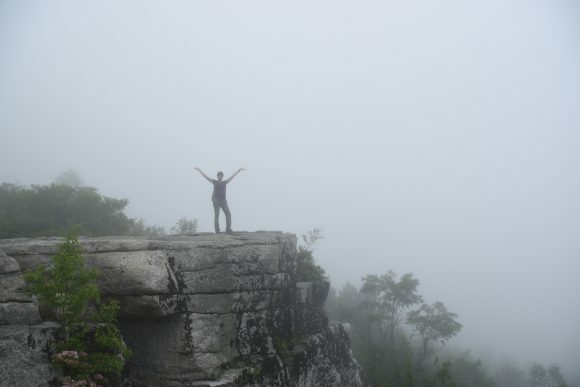 You can learn more about Sam’s Point Preserve and the trails at the Minnewaska State Park website. 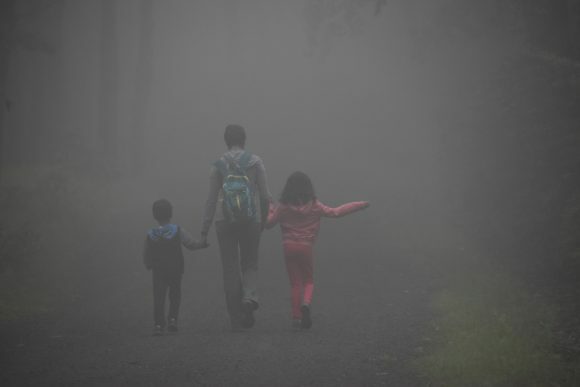 Love hiking with the family? 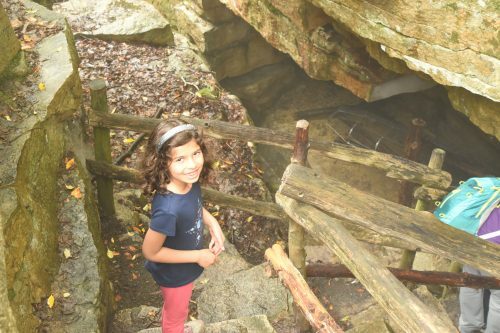 Click over to these articles for more local hiking trails for kids. 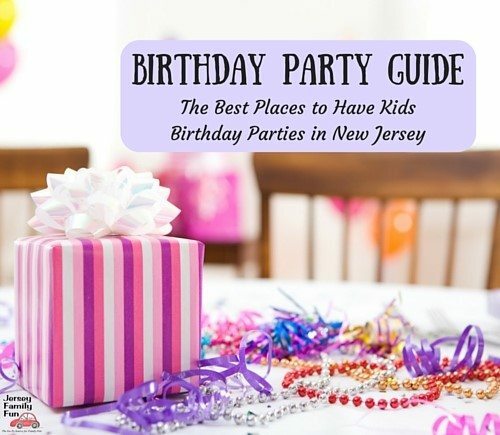 Visit our Family Travel to New York series for more ideas on things to do in New York. Victoria is mom to a 7 year old daughter and 4 year old son. Having lived in New Orleans, St. Louis, Austin, San Francisco, and Manhattan, she now makes Essex County her home. Her passion is wandering the outdoors with her family. 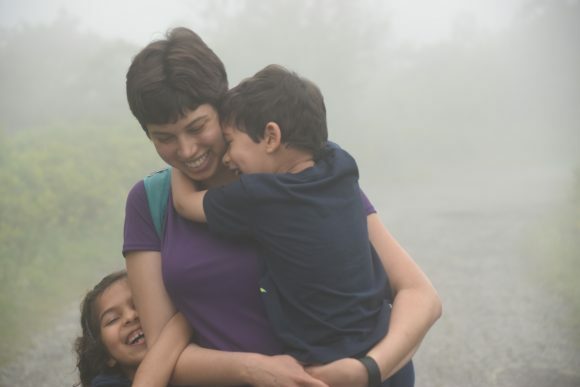 As soon as her kids could walk, they have been hiking the trails around New Jersey, New York, and Pennsylvania. She loves exploring the area and never forgets the treats and sweets to motivate the kids (and husband) to keep going when a temper tantrum occurs at the furthest point from the car!